UPDATE: Currently, PicoBrew postponed the Pico U development until later this year. We will update this post as soon as details change. PicoBrew is looking to dominate the market for automated brewing systems. It just announced another new system, shortly after the release of the Pico Z. 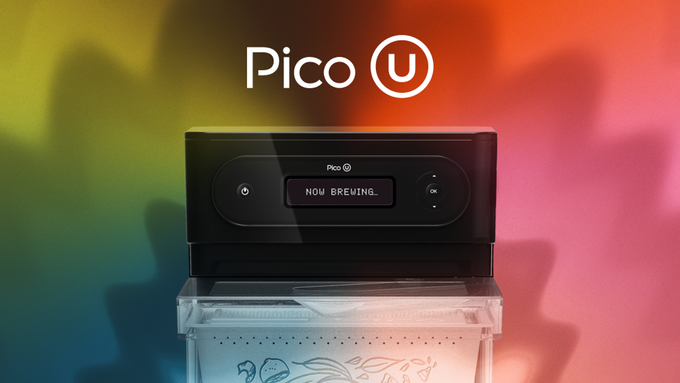 Unlike the other Pico brand automated brewing systems, the Pico U touts the ability to brew more than beer. It has built in features to brew beer, hot and cold brew coffee, hot and cold brew tea, kombucha and soda. It also has sous vide cooking capability. It’s clear that Pico is looking to expand beyond the automated beer system into other brewing markets. This would make it the first system to do so. However, they are also at the forefront of decreasing prices, making auto brewing machines much more appealing to the masses. The initial announcement featured two models of the Pico U. The basic, and the deluxe. The basic system is only capable of producing hot coffee and tea in either a single serve or bruet capacity. The deluxe system is capable of those, as well as the others listed above (beer, soda, cold brew, kombucha etc.). During the Kickstarter campaign, the Pico U deluxe system was available for $249. One of the biggest improvements in the Pico’s technology during this launch was the ability to use your own grain, tea, or other ingredients. Previously, other Pico systems required single use PicoPaks. This was a pain point of several users, especially those overseas who had to pay high shipping costs every time they ordered PicoPaks. 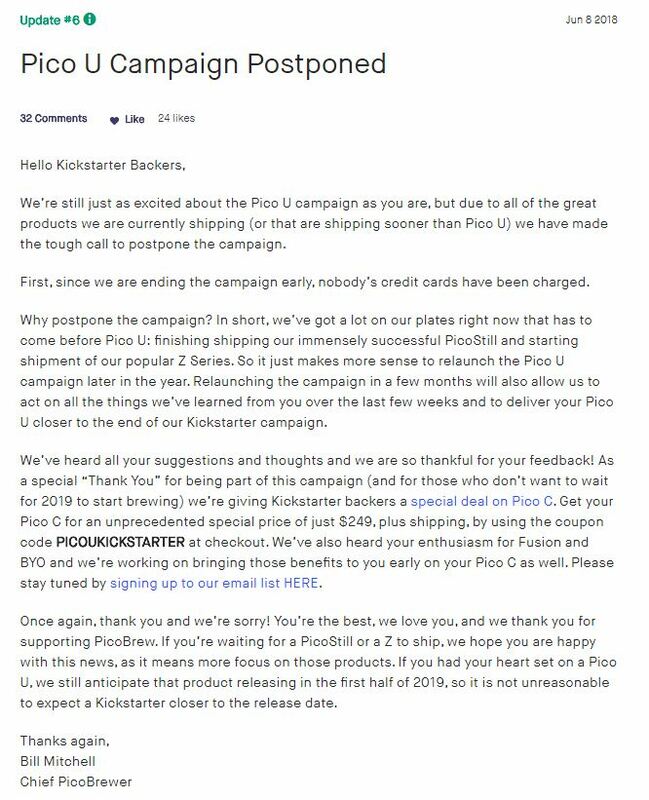 Despite being successfully funded, by a wide margin, PicoBrew has postponed the campaign after reaching over 800% funding. One of the reasons given for the postponement was wrapping up initial orders of other new systems like the PicoStill and Pico Z. This makes sense, but it seems a little foresight might have been beneficial, as the views on the postponement were mixed. The PicoZ launched just a few months ago, so there shouldn’t have been such a huge rush to announce another new system. Some backers were upset, as they felt the campaign was simply for market research, and they never planned to see the campaign through to completion at that time. Pico announced that it will relaunch the U series in it’s line of automated brewing systems in the Fall. How well the relaunch campaign goes remains to be seen, however, any backlash is not likely to cause the campaign to fail completely. With so many different automated brewing systems available, from PicoBrew alone, it can get confusing. Here is how the U stacks up to other available Pico systems. For this comparison, we’ll only look at the full-featured deluxe system, as the basic is little more than an advanced coffee maker. In the cost department, the U model ($249) is about $150 cheaper than the Pico C ($399). Since the U features the same capabilities and more, the U is a significant upgrade over the C at an even lower price. Price-wise, the U will be the most affordable, complete Pico system and automated brewing system on the market. Comparably, it’s the same price as the PicoStill, which is an add-on that requires you to already own a Pico system. The only cheaper offering is their PicoFerm, which is simply a fermentation tracker and not a brewing tool. The U is certainly more tailored for home enthusiasts and doesn’t have the beer brewing capacity of the modular Pico Z or Zymatic systems. However, the Z and Zymatic are significantly more expensive. The Pico U is the first system to be able to brew coffee, tea, kombucha, soda or serve as a sous vide cooker. Kombucha has reached a pretty high popularity as brewing trends go. This is because of how easy it is to brew. Coffee is definitely growing, especially those looking to by more specialty beans. Less people are looking to buy stale bulk coffee from the grocery store and are turning to other options, or at the very least grinding their own coffee at home. Pico U is also dipping its toe into specialty beverages. Just do a quick Pinterest search on cool summer drinks and see everything that comes up. 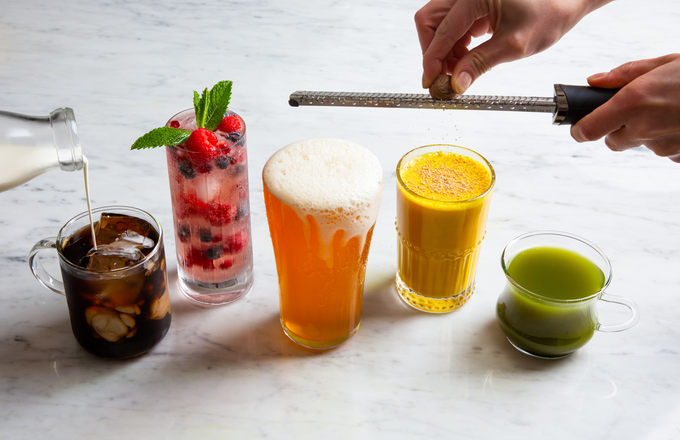 The market is oozing with opportunity there, and there is little competition as far as specialty drinks are concerned. It seems as if PicoBrew has seen the automated brewing system market beginning to saturate, and is looking for a few extra branches to grow from. At its core, Pico is definitely a brand associated with beer brewing systems, and always will be, this expansion into other markets seems like a smart preemptive move.